Is the floor of SOMArts always this glossy gray? I asked as I stepped into the cavernous cultural center’s main gallery. Yes, the gallery attendant confirmed, it’s always this glossy gray. There’s just less stuff in the gallery, she explained, and the lighting (spotlights instead of overhead fluorescents) makes the space feel different. Something (you can’t see, on the other side, of a wall from this side) casts a shadow not only contains less work than your everyday SOMArts show (clocking in at just 17 artists), the art itself isn’t your ordinary fare. And by ordinary fare, I mean work by local, living practitioners. Only three of the 17 fall into that category. Instead of sampling the current work of Bay Area artists, Something is an exhibition that plucks its ingredients—carefully, purposefully—from different times and places to reflect on a very immediate and local question: How do bodies in a changing urban landscape challenge the forces that seek to erase them? In an elegant and uncrowded installation, curator Juana Berrío (former artistic director of Kiria Koula, a now-closed gallery and bookstore in San Francisco’s Mission District) brings together photography, video, sculpture, conceptual art, graphic scores of improvised music and an artist-made walk to demonstrate the very different ways artists might respond to that question. Gordon Parks' 1952 silver gelatin print, a composite image of the New York skyline and the subterranean lightbulb-covered dwelling of Ralph Ellison's Invisible Man, provides the most literal illustration of the above, but for the most part Something takes an oblique look at the Bay Area’s housing crisis, one that doesn’t presume to offer solutions, but rather introduces artistic tactics for humanizing the way we look at, move through and use urban space. The print hangs on narrow monolith-like wall that supports, on its opposite side, a very small platinum print by Catherine Opie, a photographer better known for colorful portraits of queer communities. Bookending Wojnarowicz’s consideration of bodies large and small is Opie’s image of a freeway under construction, a structure that conveys bodies, but also destroys them, divides them and, in the case of the neighborhood around SOMArts, often shelters them. 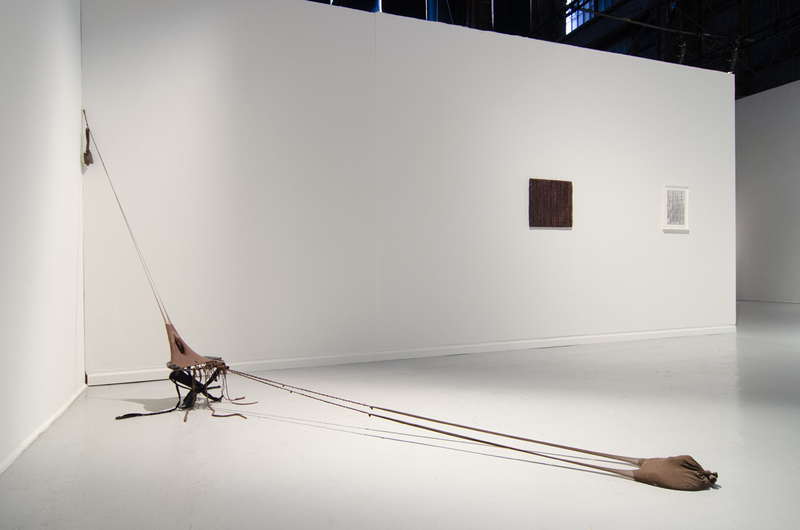 This push and pull between human-scale concerns and the larger forces that attempt to exert control over humans continues throughout the exhibition. 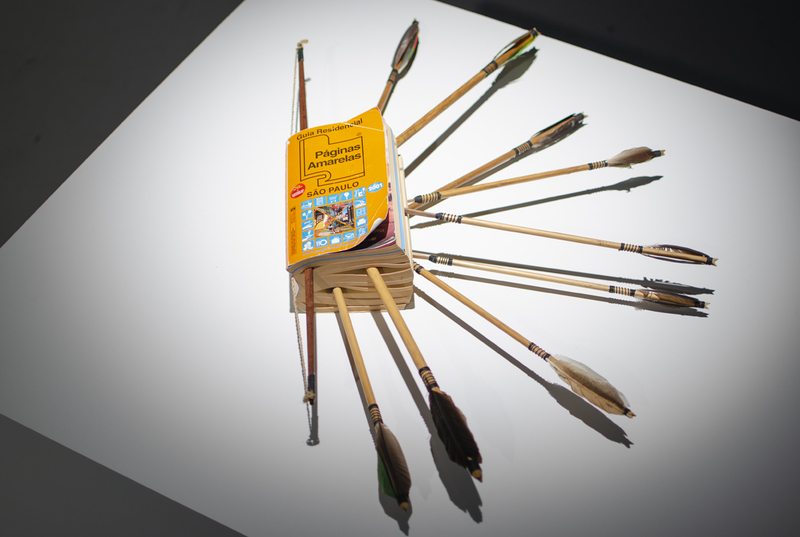 Abraham Cruzvillegas’ Wright Imperial Hotel impales a São Paulo phone book—a futile attempt at representing an entire population—with wooden arrows, a nod to Brazil’s indigenous communities and all who might not have official addresses or phone numbers. In Zoe Leonard’s photograph Two trees, she captures two tree trunks in New York that have grown through and around the chain-link fence meant to demarcate a human boundary. Sculptures made from discarded or repurposed materials signal another kind of resistance against societal norms. 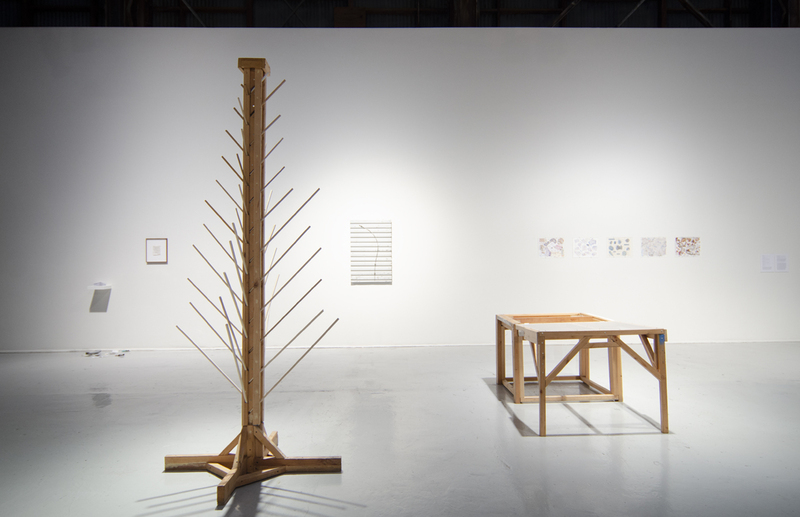 Carl Hendrickson’s untitled wooden constructions look like they might have multiple, fanciful uses (hat rack or minimalist Christmas tree? ), and Davina Semo’s wall piece of corrugated metal, titled MAYBE SHE FELT THE SAME, OR MAYBE HER HEAD WAS SOMEWHERE ELSE, lends personality and agency to rough industrial materials. Something’s palette is full of somber browns and grays, but that doesn’t mean the show itself if uniformly solemn. 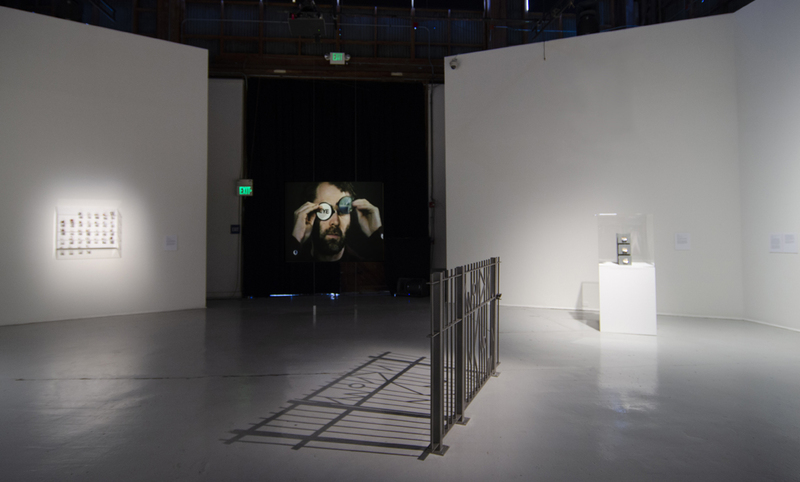 Stuart Sherman’s looping videos of the artist performing thematic “spectacles” with everyday objects are equal parts experimental theater and absurdist ritual. And David Wilson’s Walk to a Place, a folded takeaway that charts the artist’s route from SOMArts to a Potrero Hill vista to the Dogpatch print shop where he made the photocopies for the show, is annotated with cheerful conversational text and breezy sketches. Despite these more lighthearted interventions into everyday city life, it’s David Hammons’ Phat Free, which provides the exhibition’s soundtrack and perhaps best captures the conflict at the center of Something’s operating question. Feathery video shows the artist kicking a pail, with a grinding scrape and rattle, through the empty streets of nighttime New York City. He loudly, even confrontationally, claims the sidewalk and everything within earshot of his racket. There are few bodies represented in Something, but maybe that's because there are so many bodies outside of the gallery, across SoMA, San Francisco and the Bay Area, who exist where the city would rather they not. 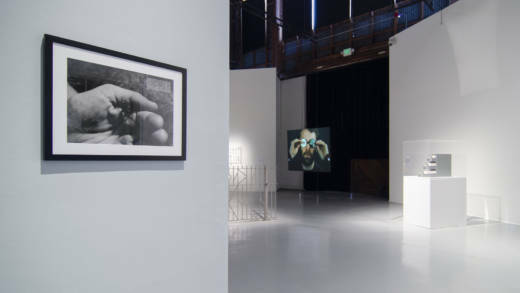 In Dodie Bellamy’s essay “In the Shadow of the Twitter Towers,” included in her collection When the Sick Rule the World and part of the exhibition’s reading room, she writes about confronting the daily dissonance of observing San Francisco’s homeless population outside of luxury condos and Twitter HQ. Something you can't see still casts a shadow. 'Something (you can’t see, on the other side, of a wall from this side) casts a shadow' is on view at SOMArts Cultural Center through Aug. 14, 2018. Details here.